After arriving, your first stop should be the Chamber of Commerce, in the heart of the village on historic Riverside Drive. The friendly staff will answer all of your questions, and help with maps, guides and anything else you need. With so many choices, your most difficult decision will be where to begin! Why not take in a museum? Clayton is home to three museums and an opera house. Take a leisurely stroll around the Village browsing our art galleries and shops for gifts and keepsakes. Explore the beauty of the 1000 Islands aboard one of our local tour boat operators which depart several times a day offering narrated tours of Clayton and the 1000 Islands region. Almost every weekend during the summer there are events held at the Recreation Park Arena including a Boat Show, Dog Show, Food & Wine Festival, Decoy & Wildlife Art Show, Collectibles Show, Antique Show & Sale, Juried Craft Show and a Model Train Fair. Want to take a moment to just relax? Why not treat yourself to a massage or facial at a day spa or maybe a haircut? Clayton’s salons welcome walk in visitors. The local library on John Street welcomes visitors, and has Internet ready computers where you can check your e-mail. You are also welcome to join us on Sunday morning at one of our many friendly churches. 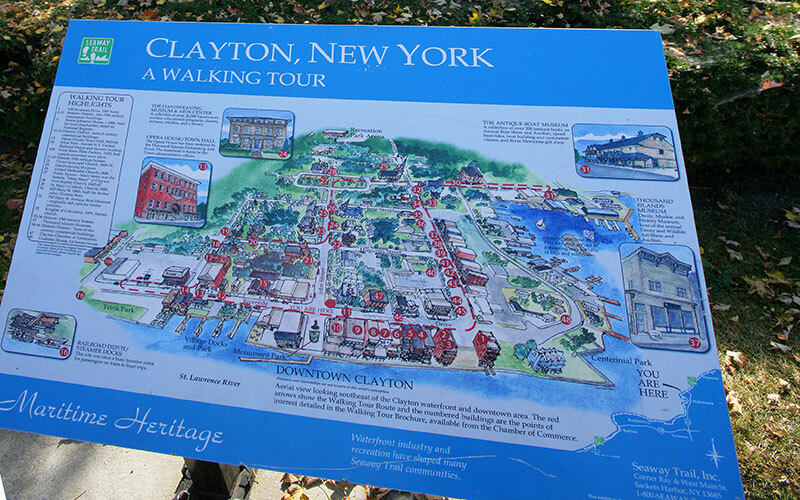 You can easily use Clayton as your vacation “home base,” with the Minna Anthony Common Nature Center, miniature golf, a go kart track, the Thousand Islands Bridge, historic Boldt Castle and Singer Castle, the Tibbits Point Light House as well as Alexandria Bay, Cape Vincent and the Canadian border all close by. Destination distillery creating premium-grade distilled products from locally grown grains and fruit. Open Year Round. Summer Hours: Memorial Day-Labor Day, Open Mon-Weds, 10am-5pm; Thurs-Sat, 10am-8pm, Sun 12pm-5pm. Winter Hours: Labor Day – Memorial Day, Closed Mon & Tues; open Wed-Sat 10am-5pm; Sun 12pm-5pm.